I have a SQL Server 2012 instance, and an Active Directory group, which I can add Active Directory users to. I have my personal AD account (MyAccount) and a service account (ServiceAccount) in that group. I need to grant admin access to this AD group, for the whole instance. This means that I won't need to execute grant commands to every new table and database created. Any user on that group will automatically be able to create, drop, insert, select, etc. Even trickier. I must be able to use Windows Authentication to login with MyAccount (I login on Windows and then login to SQL Server without needing to type username-password again), and login using ServiceAccount by typing username and password. I can't be forced to login on Windows with ServiceAccount (or run SSMS/SSDT/etc with that account) to be able to login on MSSQL. What's the best practice for configuring that? Some of what you are asking for is actually pretty simple. db_ddladmin - Role that grants permissions to create/modify objects within a DB. db_datawriter - Role that grants permissions to run UPDATE, INSERT or DELETE statements against any table/view in the DB. EXECUTE - Permission that grants the ability to EXECUTE any stored procedure or function within the database. To add this run the following on each user database. If you want these permissions added to new user databases then run the script in the model database as well. If you have an application running under your service account then when that application connects using trusted authentication it will connect to SQL using that service account. If however you want to connect to SQL using something like SSMS then you have two choices. You can either log into a machine using the service account or run SSMS as a different user. You'll then get a login/password prompt for an AD login. Type in your service account name & password. Once SSMS opens any trusted (windows auth) connections will be made using the AD login you connected under (your serviced account in this case). That will allow any user who is a member of [DOMAIN\ADGroupName] to login to SQL Server without specifying a username/password, and will grant those users admin access to the entire instance, including all databases. Granting CONTROL SERVER rights to a group or login in this way allows you to also DENY access to particular objects or databases. For instance, you could DENY ALTER ON DATABASE::master TO [DOMAIN\ADGroupName]; to prevent those users from making changes to master, while still allowing them to create and drop other databases, tables, etc. Be aware that a user with CONTROL SERVER rights could easily create a SQL login, grant that login sysadmin access, and have complete access to everything in SQL Server, including uncontrolled access to master. This is generally considered a pretty sizable security risk, and should likely only ever be used on non-production boxes. I use the most excellent SQL Server permissions hierarchy poster to see a high-level-view of the implications of particular permissions. Not the answer you're looking for? Browse other questions tagged sql-server sql-server-2012 permissions security active-directory or ask your own question. 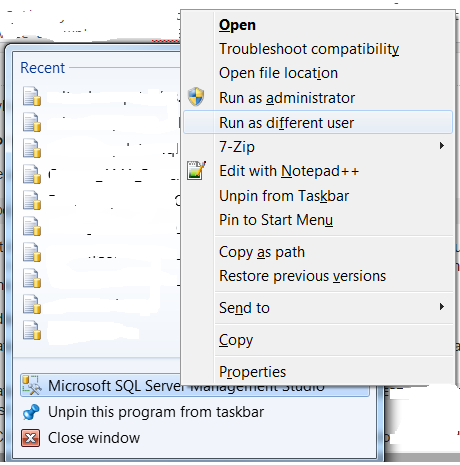 Should I delete disabled windows Active Directory accounts from SQL 2008? When mirroring accounts for Sql Server Windows Authentication, do both have to be local?